The 2012 Tim Hortons NHL All-Star Game comes to Ottawa, and for the second year in a row, the teams will be picked by captains (and former teammates) Daniel Alfredsson and Zdeno Chara. After the All-Star Player Fantasy Draft on Thursday and the 2012 Molson Canadian NHL Skills Competition on Saturday, the puck will drop at Scotiabank Place for the big game on Sunday (4 p.m. ET, NBCSP, CBC, RDS). The game has evolved from the early days, when defense and goaltending dominated. For most of the past two decades, it's been an offensive bonanza and a nightmare for the goaltenders -- though happily for the goalies, they now play just one period apiece. Here's a look at some All-Star history ... by the numbers. 0 -- Goals allowed by Evgeni Nabokov, then with the San Jose Sharks, for the West team in the second period of the 2008 game in Atlanta. Nabokov is the last goaltender to play in an All-Star Game without allowing a goal. 1 -- Goal allowed by Gilles Villemure of the New York Rangers in his three All-Star appearances (1971, 1972, 1973), totaling 88 minutes. His 0.68 goals-against average is the best by any goaltender who has played two or more games and 60 or more minutes. 2 -- Defensemen who have been named Most Valuable Player of an All-Star Game. Both played for the Boston Bruins -- Bobby Orr was the MVP in the 1972 game; Ray Bourque won MVP honors 24 years later. 3 -- MVP awards for Wayne Gretzky, tying him with Mario Lemieux for the most by any player in All-Star competition. Unlike Lemieux, who played his whole career with Pittsburgh, Gretzky had one MVP award each while playing with Edmonton (1983), Los Angeles (1989) and the Rangers (1999). 4 -- Goals scored by Gretzky in the third period of the 1983 game at Nassau Coliseum. Four other players have scored four times in a game, but only Gretzky had his four goals in the same period. 5 -- Assists by Montreal's Mats Naslund in 1988, the most by any player in a single All-Star Game. Seven players have had four assists in a game; Adam Oates did it twice. 5 -- All-Star Games that have been decided after 60 minutes. The first was the 1978 game in Buffalo, won 3-2 in overtime by the Wales Conference. The most recent was 2009 in Montreal, a game won 12-11 in a shootout by the Eastern Conference. 6 -- Position players who have made the All-Star Game with four different clubs. Brendan Shanahan (2007) is the most recent. Gaye Stewart is the only one to do it entirely in the Original Six era. In addition, one goaltender (Terry Sawchuk) also represented four teams as an All-Star. 7 -- Wins by Scotty Bowman, the most by any coach in All-Star history. On the other hand, Bowman also holds the record for most losses (five) -- a consequence of owning the mark for most All-Star Games coached (13 -- including one tie). 8 -- Difference in days in the ages of Carolina's Jeff Skinner and Detroit's Steve Yzerman, the two youngest players to be selected for an All-Star Game. Yzerman was 18 years, eight months, 22 days old in 1984; he was the youngest player chosen until Skinner made the team last year. 9 -- Sets of brothers who have been All-Star teammates. Eric and Marc Staal became the ninth set when Eric picked his younger brother in last year's All-Star Player Fantasy Draft. The Sedin twins, who opposed each other last year, could join this list if they're picked for the same team this year. 10 -- Largest margin of victory in an All-Star Game. The Wales Conference topped the Campbell Conference 16-6 in Montreal in 1993. The 16 goals were the most by one team in All-Star history. 12 -- Most goals by a losing team. The World team scored 12 times in 2001, but it wasn't enough to beat the North American squad, which won 14-12. The combined total of 26 goals also is an All-Star record. 12 -- Games hosted by the Montreal Canadiens, the most of any franchise. The 12th came in 2009, when the East beat the West 12-11 in a shootout. Toronto is second with nine All-Star Games. 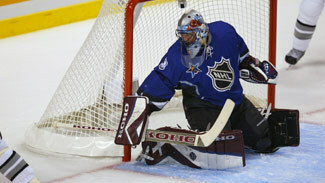 13 -- Appearances by goaltender Glenn Hall, the most by a goaltender in the history of the All-Star Game. Hall also holds the record for consecutive appearances (nine) and minutes played (540). 16 -- Years since there were fewer than 10 goals scored in an All-Star Game. The last time was 1996, when the East edged the West 5-4 in Boston. 25 -- Penalty minutes taken by Gordie Howe, the most by any player in All-Star competition. Gus Mortensen is second with 21 penalty minutes -- but he compiled his total in just nine appearances; Howe played in a record 23 games. 31 -- Goals allowed by Patrick Roy in his 11 All-Star appearances, the most by any goaltender. Roy started 10 times in those 11 games, played 250 minutes -- and won his only two decisions. 51 -- Howe's age in the last of his record 23 All-Star appearances, which took place in Detroit in 1980. Howe was 51 years, 10 months and 5 days old when he skated onto the ice at Joe Louis Arena as a member of the Hartford Whalers. 56 -- Shots on goal by the East in its 9-8 victory against the West in 1994 at New York's Madison Square Garden, the most by one team in an All-Star Game. The combined total of 102 shots on goal also set an All-Star record, later matched in 2009. 68 -- Seconds needed to score the fastest three goals by a team in All-Star history. The Wales Conference got two goals by Mike Gartner and one from Petr Bondra in a span of 1:08 during the first period in 1993.